Christiania for sale – and what is somebody who sews? For reasons that are far too boring to go into here, Elsie and I need to find a new home for our beloved Christiania cargo trike, and I’m rather hoping that having the phrase “Christiania for sale” in the title of this blog post may help us to do just that. We bought it new in June 2010, it’s in jolly good condition, and the current list price including the extras ours has is something over £1800. We therefore start talking at £1100, and an email to sidandelsie (at) btinternet.com will start the process whereby you can become the new owner of this versatile and very environmentally-friendly vehicle. OK, advert over, so lets move on to sewers. What is the word for somebody who sews? If you’re British, and the somebody who sews is employed in a factory to sew on a machine, you call her a machinist, which is fine, even though a machinist is also a bloke who works machinery such as lathes, milling machines and so on. But what is the Brit word for somebody who sits at home and sews, if she uses a machine but isn’t a dressmaker? I keep seeing people on the interweb use the word “sewist”, which is an abomination guaranteed to offend the sensibility of any right-thinking person. Using “sewist” is even worse than using the word “harp” to describe the throat space of a sewing machine irather than the irritating musical instrument often played at downmarket English wedding receptions in an attempt to lend an air of class to the proceedings . But what about “sewer”? If you’re in the US of A, the word rhymes with “mower” and it means somebody who sews. But if you’re a Brit, it rhymes with “brewer” and it means a pipe which conveys sewage. So I have two questions. Is “sewer” actually in real-world use in the US to mean somebody who sews? And is there such a thing as a British term for somebody who uses a sewing machine at home but who isn’t a dressmaker? Come to think of it, make that three questions. If it’s not a sewer, what is the American name for the big pipe under the road which takes away your sewage? 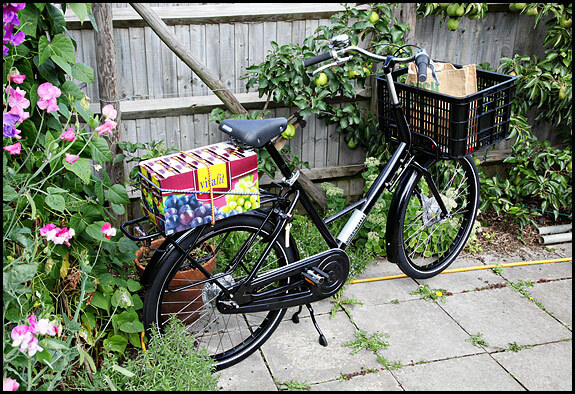 Our new bike came on Friday, so when I got back from the shops this morning I thought I’d take a snap of it before it rained. So I did. And then it did. Rain, that is. Anyhow, as you may have guessed from the title of this post, this fine bicycle is a unisex, one-size fits all Workcycles FR8, pronounced “freight”. Presumably whoever came up with the name spends a lot of his time on his phone sending text messages to his m8s. Be that as it may, our FR8 has come all the way from Amsterdam via Bristol, courtesy of Really Useful Rob at Really Useful Bikes, who deserves not only a plug here but also a medal for his perseverance when the factory quotes him 6-8 weeks delivery and then takes 12. It got here in the end though and we’re really chuffed with it. 8-speed hub gears, enclosed chain, drum brakes and hub dynamo equals low maintenance, and it’s amazing what it’ll carry with no ill effects. I’m sure I’ve seen a picture of one on the interweb with a load of stuff in the crate ( or perhaps in the CR8?) on the front, and two toddlers in child seats on the back carrier. 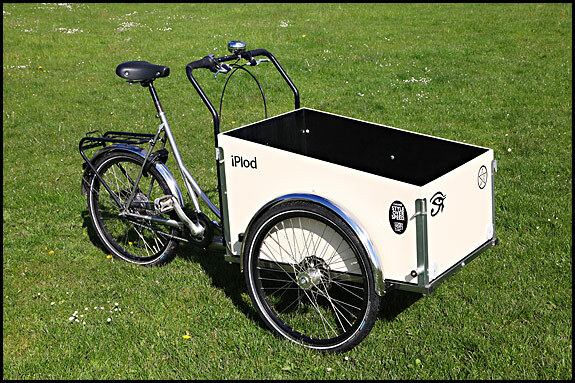 Picture credits: Bicycle by Workcycles. Hampstead-style planet-saver hessian shopping bag courtesy of Borough Market. Red grape juice from Lidl (we’re not proud here). Left foreground: old-fashioned sweet peas and sweet pea Hubert Son’s Peaches (no, honestly) from Ferme de Sainte Marthe, Montfort l’Amaury, France. Behind: climbing French bean Gazes Brown Seeded, grown from seed swapped at Seedy Sunday in Hove last year (gosh, just how eco is that?). Background: cooking apple Lady Henniker (makes a nice pie, that does) and pear Williams Bon Chretien (which in case you’re wondering bottles very well indeed). Fruit and veg grown organically by Elsie, patio weeds grown organically by me. Scaffold tubes courtesy of the building site down the lane, and I think that’s about it.